Minestrone in a 28 oz can? Is Trader Joe’s plunging into madness – or simply ahead of the curve? A pint of paint, probably pale blue, is the first thing I think of when I see this can. But did you know it’s actually a soup? Can I be blamed really? 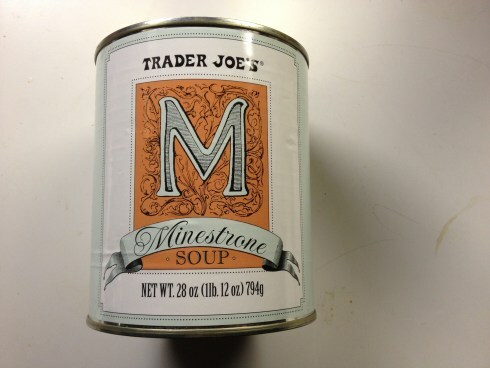 An utterly ordinary soup, the kind done by every soup brand does some lackluster take on, packaged in an overly large can that flagrantly disregards the only rule of soup can packaging – show me what the soup looks like – in favor of a single, enormous letter “M”. To my thinking, if you’re selling a product that’s totally concealed inside its packaging, and you’ve not putting a picture of it on the front, it must be ungodly disgusting. 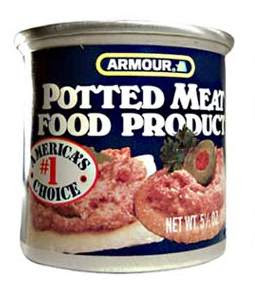 Even bottom of the bottom shelf brand Armour put a picture of their “Potted Meat Food Product” on the front. So does Epicure Cured Ox Tongue with Gelatin – and it looks as bad as it sounds. How much worse must TJ’s minestrone soup look then? The answer, to my surprise, is that this minestrone looks and tastes delicious. The field of canned minestrone soups is not exactly an illustrious one, but this minestrone is king of it. The soup is hearty and well-balanced, chock-a-block with the expected vegetables (green beans, peas, peppers, potatoes), and supple pasta all suspended in a thick tomato broth. And the amazing thing is that they managed to do it all right. The veggies are not too hard or soft. The pasta is pleasant to nibble on. 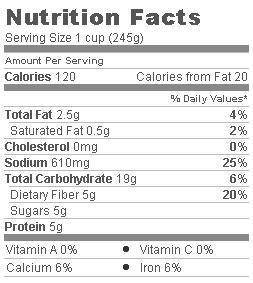 The broth is well-balanced in proportion to the other ingredients, and while substantial doesn’t dominate the flavor. Simply put, it’s clearly the result of someone thinking about what makes a good soup. Even more to the point, this canned soup, heated in my microwave, was better than any minestrone I’ve had served to me in the last decade. The only criticism I have, and it is a very mild one, is that the soup lacks meat. I know that the recipe for minestrone is nebulous at best, but the addition of some tasty beef cubes would have made this soup irreproachable. Interestingly, even though the broth is tomato based, the soup doesn’t receive the vegetarian stamp of approval. Would I Recommend: Yes, to soup lovers everywhere. Would I Buy It Again: I plan on stocking my larder with it throughout winter. Final Synopsis: Weird can – great soup. VERY GOOD SOUP,,ALSO USED FOR BASE OF A MASTER SOUP ETC..DO NOT TAKE OFF SHELVES JOE.. It is already gone (discontinued) in Phoenix, AZ.